The top left 100 µm scale bar applies to figs. la and 2-5; the other figs. each have their own scale bar. Figs. la,b, 5-7. 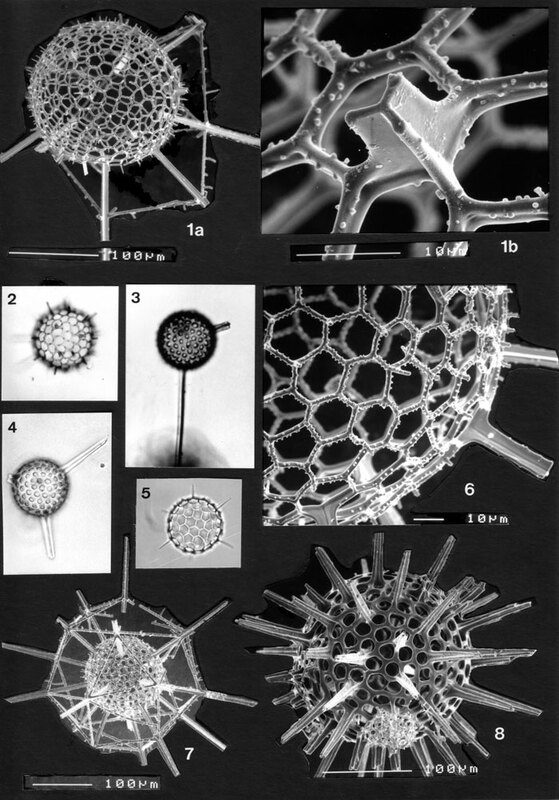 Diplosphaera hexagonalis. Note smoothed I-beam structure in fig. lb, the proximal implantation of the three-bladed main spine (i.e. the spine develops together with the innermost, not the outer, shell layer), and the haphazard arrangement of ornamental knobs. BSS 28B(IX/1215, 1296); BSS 30B(F) EF E23; 28B(VIII/970). Figs. 3, 4. Diplosphaera lychnosphaera (juveniles). Note the raised rims of pores in fig 3; cp. with Pl. 22 fig. 4. RSW 86(F) and IOW 112(F). Figs. 2, 8. Diplosphaera dendrites. In fig. 2, spinal knobs are developed at the center of bars, not on the nodal points. IOW 112(F) and BSS 28B(IX/1237).